There it was "Prof. Hewlett of Wisconsin Finds Proof of His Sister's Fate." I will admit that I have a fascination with stories of the Yukon Gold Rush; the wild adventures: the life and death struggles in the frozen north. But this was totally different from any of the tales I had read. 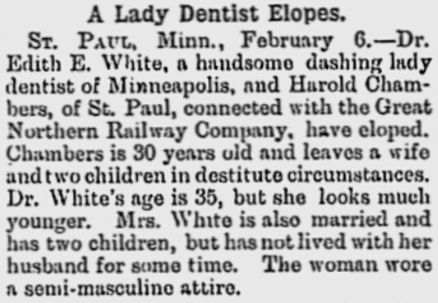 I found another article in the Minneapolis Journal of October 29, 1906: “Graduate of “U’ Met Tragic Fate…Tale of Wolves Devouring Her Body.” Here was a woman who, I was to find, cast away all conventions and trekked into the wilderness to satisfy her desire for adventure and knowledge. Here was a tough, independent woman who in her life had determined to live her way no matter what the customs of the times demanded. I started my search. The first story related that the professor had found "part of the skull, a rib, a femur and bits of clothing" in a two year search through the wilderness in search of an answer to her disappearance. Who was she? Who was the brother who searched the northern wilderness? Let's start at the beginning. Frank and Edith Hewett grew up in the tiny village of Kingston, Green Lake County, Wisconsin. Their father, Alonzo P. Hewett was the son of the earliest settler, Charles Hewett who brought his family west to that place in 1844, Alonzo being 14 at the time. 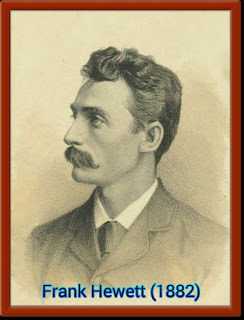 Alonzo married Kate Knowlton and in about 1851 Frank Hewett was born. In 1855 or 1856 (dates rarely agree on old records) his little sister Edith was born. No doubt, like most big brothers, he felt a special bond and obligation to his sister’s safety. Alonzo made several trips to Iowa to establish himself on a new frontier in 1853 and 1855. He stayed for under a year each time because the winters were “too severe”, and the “comforts of the west too scarce to enable him to stand the pressure.” It was during this second sojourn in Iowa that Edith was born. After her birth Alonzo returned to Kingston, and remained with his family until 1875 when, apparently finding the state sufficiently civilized, he returned to Lime Springs, Iowa. Alonzo's family was musically talented. In 1861, at age 31, he enlisted at Fond Du Lac Wisconsin in the 3rd Wisconsin Infantry as a musician in the regimental band. He was discharged for disability in August of 1862 and returned to his trade as a wagon maker until returning to Iowa in 1875 where he worked as a carpenter and builder. He established a hotel called The Hewett House. Frank established himself in Forest City, Iowa as a music teacher. Later, as we shall see, he entered show business. 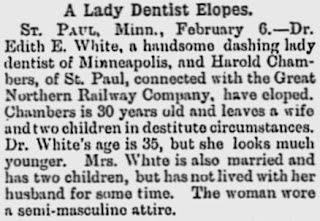 In the 1885 Edith Hewett White was a housewife with two children living in Minneapolis with her husband, John A. White, who worked for the Minneapolis Harvester Works. They had married in January of 1878, when Edith was 22 and John 26. In 1879 a daughter, Vera was born. In August of 1881 a son, John A. White II, was born. Apparently he died early for he does not appear in later census records. In 1883 another daughter, Alace was born. In 1885 a son John P. White was born. He died at age 2 on September 18, 1887. Shortly after his death Edith and her Husband separated. Perhaps it was the loss of another child that led to the estrangement. Perhaps it was her desire to participate in the theatre, or her desire to pursue a career other than that of housewife. According to one source, she had taken up acting in community theatrical productions. Edith enrolled in the University Of Minnesota School Of Dentistry in 1888. While attending the university she took up the sport of fencing. The only photo I found of her was taken with her fencing foil and shows a dashing woman, seemingly much younger than her actual age, for she was then in her mid-thirties. 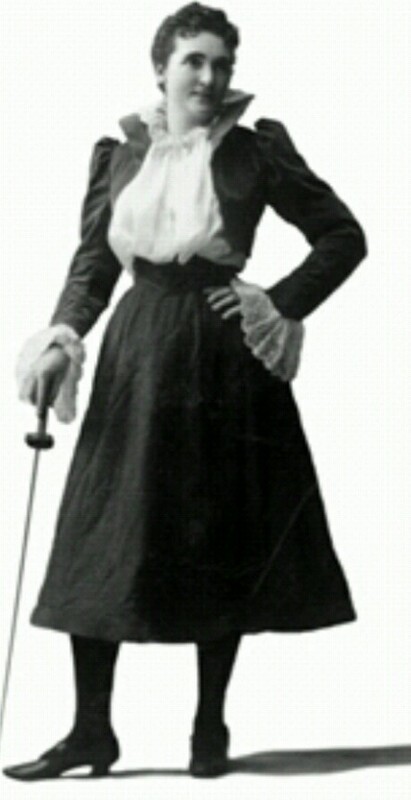 On June 5, 1890 she was the first woman to be conferred the degree of D. D. S. at the university. Her fencing photo adorns the college brochures and literature to this day. White and Chambers fled from their families and friends, first to Winona, Minnesota and then to East St. Louis where Chambers found work in a railroad office. Chambers left a wife and two children ages 3 and 15 months penniless. They next appear in the available historical records in May of 1893 when they were married in Marion County, Indiana. This may not have been a legal marriage because the 1900 census shows John White and his daughter Vera living in Mankato, Minnesota where he stated he was married and had been so for 22 years. In the years when Edith was married and raising her children, her older brother Frank was becoming an entertainer. He was something of a prodigy, skilled in playing the violin, cornet, flute, piccolo, and the clarinet. Beginning in about 1877 Frank worked as a musician with various troops traveling the world. 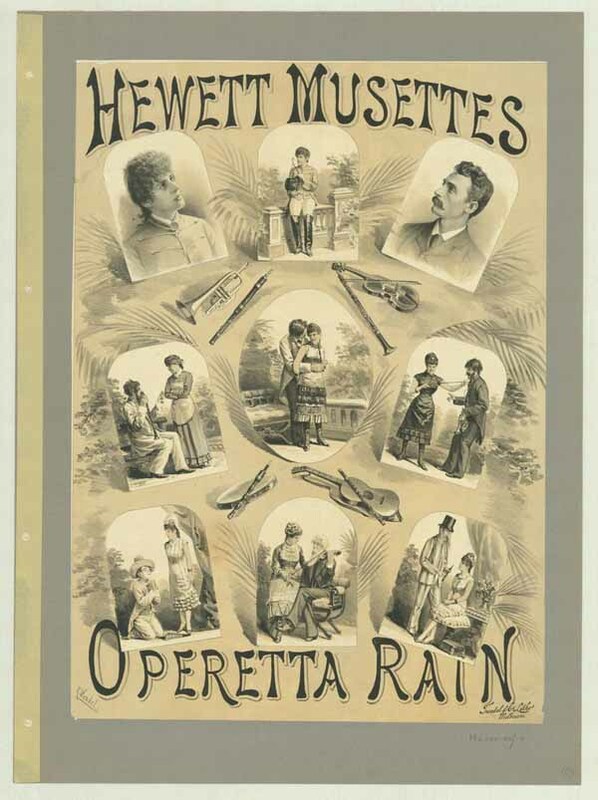 Whether by ambition or necessity, Frank joined with Eva Pear in 1879 at Melbourne Australia and wrote an operetta named “Rain.” They toured Australia, New Zealand and the East Indies. 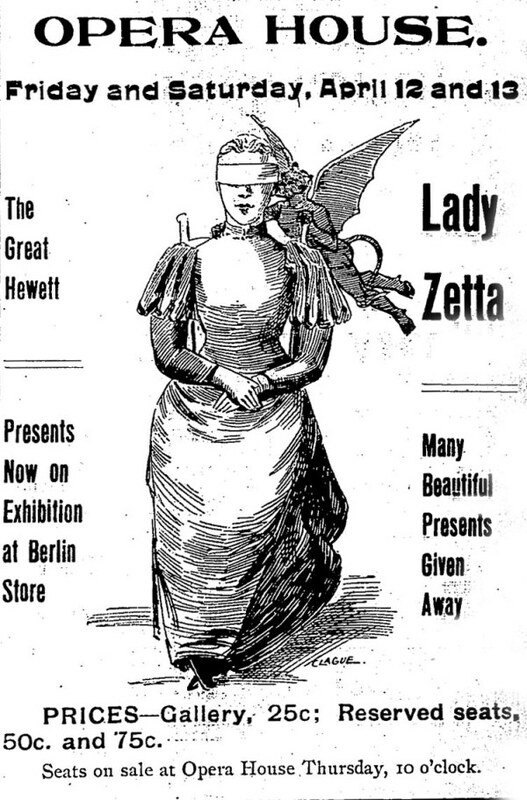 He called his small company Hewett’s Musettes. The company made a return tour of these countries in 1882, after touring the African colonies. 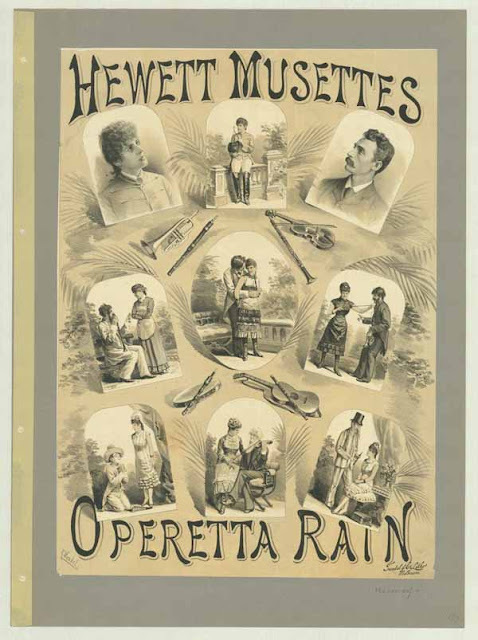 Eventually his operetta and its performance began to come under criticism. In June of 1882 the critic of the Victoria, Australia Argus wrote: “In no sense could the succession of solos be regarded as an operetta…The lady and gentleman are proficient as performers on a variety of instruments and it is for the purpose of illustrating that ability that they have embodied in a thinly constructed story a number of opportunities for playing them.” Obviously Hewett could not continue to count on the appreciation of musical talent to fill the seats. Applying the same ability to learn which had helped him to master a half dozen musical instruments, he studied legerdemain and became a stage magician, adding to his musical duties that of Illusionist. In 1907 he began supplementing his act by showing motion pictures, which were considered magical by many. At some time Edith and Harold Chambers parted company and she eventually moved to Dawson in the Yukon Territory in about 1898. This was wild and rugged country still in the throes of the Klondike Gold rush. She got a job in the offices of the Ladue mining firm, either as a dentist or clerical worker, but soon found that uninteresting and quit. She then formed the idea of writing a book about the far north. She would explore the largely unexplored regions of Alaska’s Tanana River. She outfitted herself well for the trip. A good horse and a full pack with appropriate clothing for the trip; a coat and heavy skirts to which she sewed army pants. She had a rifle, knife, matches, ointment for mosquitoes, fishing gear and her dental tools. 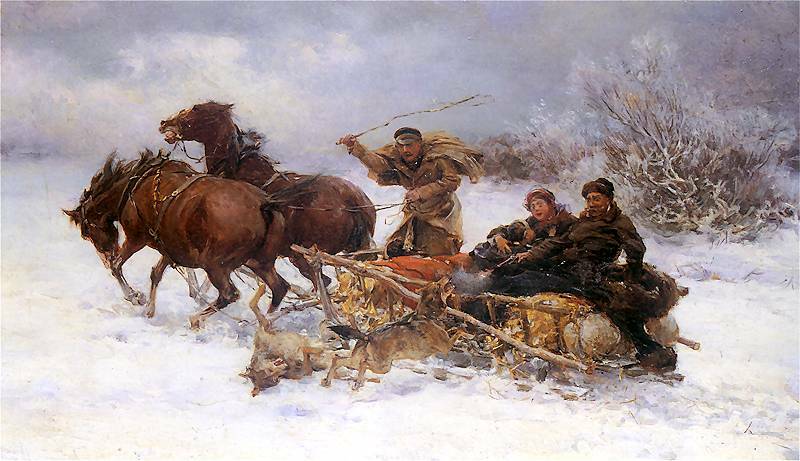 The later may have been to treat the natives as she planned to find a village with the option of wintering there. She left Dawson on July 24, 1901 and was not seen or heard from again until July of 1903 when William Shafer, a U.S. Signal Corps officer wrote to her family informing them that her diary and two letters addressed to her daughters and spouse had been found in a remote camp in the wilderness. These detailed her travels and the misfortunes that led to her death. No remains were found. Receiving this news, Frank determined that she was dead without question. She wrote of the mosquitoes that attacked to the extent that her face was swollen and red. In a real sense it was the mosquitoes that caused her death. While in camp her horse was driven to panic by the mosquitoes and wandered away. When she went to find her horse, not putting her pack out of reach, bears invaded the camp. They ripped her tent and pulled the pack apart, eating her food supply and destroying most of the rest. She turned back, but became lost in the mountains for days. She was nearly killed by mountain Lions, saving herself only by wading up to her neck in the frigid river water and standing there until the cats lost interest and moved on. She wrote in her diary that she was starving and her strength was gone. Her last entry was in October 9, 1901. By that date the average high temperature was 36. The average low is 22 degrees. The sun did not rise till 8:45 am. There was snow on the ground. Starved, she must have risked hypothermia at each stop. Frank determined to go to the North Country and find his sister's remains. 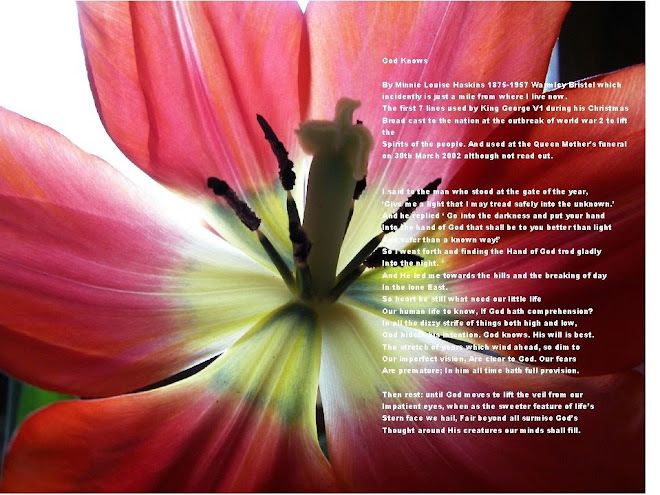 He needed to know exactly where and how she met her end, and bring back her remains for burial. With his touring schedule and the need to secure funds for the trip, he was not able to search for her until 1905. By June of that year he, his wife, six year old Edwina, and perhaps a cousin, Charles Hewett were in Dawson, Yukon Territory. They supported themselves by doing shows in the villages and mining camps. As they traveled he interviewed those who had found her diary and letters, and he heard of a man who claimed to have found her campsite and the scattered equipment and remains, which he said he buried in a barrel. Frank took a pack and wandered in the places where he felt she might be found. 1905 passed and Edith's remains were not found. The Hewett’s returned home and planned for their return in 1906. The bits of clothing were ripped into hundreds of pieces, bearing “abundant evidence” of wolves’ teeth. A merchant identified a shoe and buttons he had sold to her. That and the few bones were all that was left to account for her passage on earth. Frank wrote: The wolves had torn her to pieces, leaving but little, but enough so that I could take them to Seattle for burial.” Did she starve to death, or did the wolves attack and kill her when her strength was gone? That may never be known. Frank preferred to believe that her death was from starvation, but why should the wolves have waited? Wolves do attack humans. As recently as March 2010, a teacher and former gymnast named Candice Berner was attacked and killed by wolves while jogging on a road in Chignik Lake, Alaska. She was in excellent physical condition. Edith was not. Frank went home to Seattle, and took up a permanent residence there. He continued doing performances infrequently and managed a theater. His father, Alonzo came to live with him in his final years. He died in 1919. Frank showed movies of the Great War in 1917, and the newspaper billing added; “The Great Hewett will appear in magic and illusions at each performance.” He faced the great mystery when he passed through the last hoop, dying on April 25, 1931. He was a good big brother. Great true story, D.A., and you told it well. I couldn't stop reading, and all along I kept thinking how true it is that fact is stranger than fiction. One couldn't make up a more colourful tale. Good story, I always wonder how anyone can leave their children behind.